You are here: Home / Everyday Posts / Eat Your Greens to Give Some Green! Eat Your Greens to Give Some Green! I’m on a social good kick lately! It feels good to be able to use this platform to do something good for the community. I hope that you have taken the opportunity to participate in some of the latest events as well! Today I’d like to share with you the latest initiative from Whole Foods. My girls, Allison and Rachel love the salad bar at their school! It’s especially helpful when the scheduled school lunch just isn’t up to our family’s food standards. Having the salad bar in the school allows kids to make additional healthy choices at lunch time. Often times in schools… lunch time is the most balanced meal as child will have all day. As a mom, It’s awesome to see that Whole Foods is so supportive of Michelle Obama’s Let’s Move! 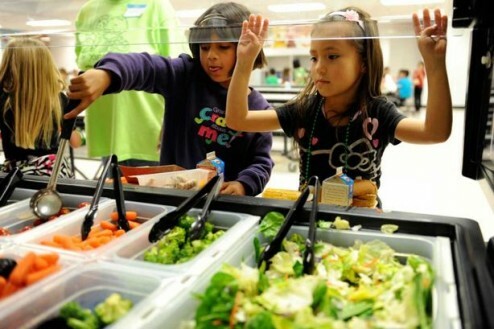 program and is helping to bring salad bars to less fortunate schools. I’ll be taking my kiddos to the Whole Foods Market on Mayo Blvd. in North. Scottsdale. If you’d like to meet up for lunch on Sunday… give me a call or shoot me a tweet @childhood and maybe we can coordinate! Every pound of food we purchase from the salad bar or hot food bar will benefit this important healthy movement in the schools! *I was offered compensation for this post… but instead have opted for a Whole Foods Market gift card that I will be donating to a friend in need. It’s all about the social good! So get out there and do some!